The Oregon Department of Agriculture (ODA) coordinates the treatment on a set area of irrigated turf grass and ornamental landscaped areas with a larvicide that kills Japanese beetle in their larval stage when they still live in the soil. This is an essential component to this eradication project. ODA requests consent for treatment from residents, including tenants or renters, from every property in the treatment area. The eradication will be most successful with everyone on board. No lawn (or ornamental bed) left behind! 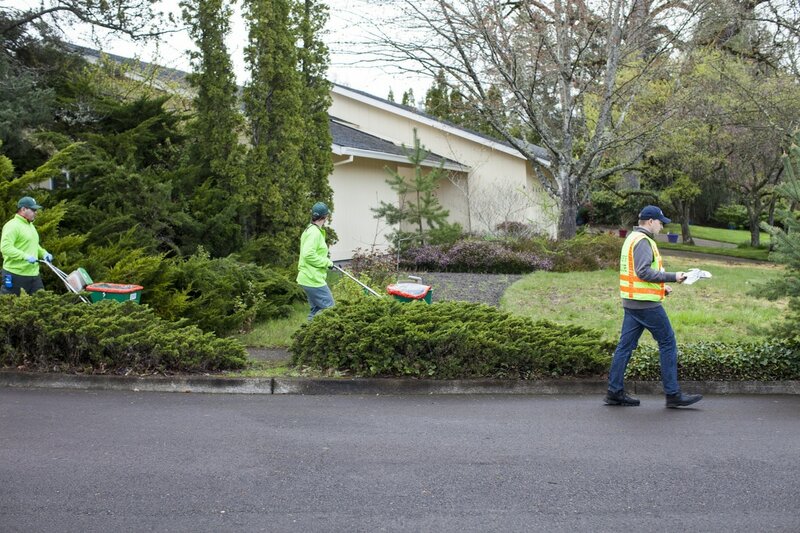 ODA employees supervise a hired commercial pest control operator to spread a granular application of Acelepryn G on the irrigated turf grass and ornamental beds of all properties in the affected areas of Washington County. Acelepryn G is a Group 28 reduced-risk larvicide. This means it has the lowest relative toxicity compared to other larvicides labeled for the same purpose. The ODA will apply the larvicide according to the most recent label instruction (visit the Health & Safety section of the FAQ page for more information about the larvicide). ODA conducted a treatment of Acelepryn G in spring 2017 and spring 2018, and is scheduling a treatment of Acelepryn G for spring 2019. 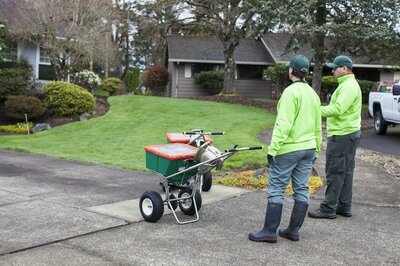 Additional springtime treatments may be required in upcoming years if we are to completely eradicate Japanese beetle. It takes ODA approximately six weeks to apply the larvicide to all properties in the affected area. Treatment may take place anytime between 8am and 5pm. There is just one treatment per property or residence scheduled for 2019. 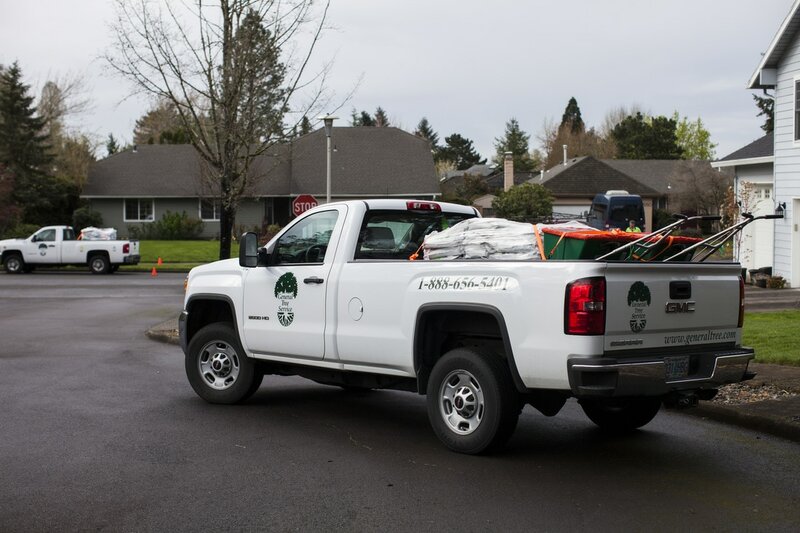 The treatment for Japanese beetles will be done by a professional, licensed pesticide applicator under contract with the Oregon Department of Agriculture (ODA). An observer from ODA will be also be present for treatment. Only lawns and ornamental planting beds will be treated. Vegetable gardens, berry bushes, and other edible plants will not be treated. This treatment consists of the application of Acelepryn G granular larvicide to lawns or ornamental planter beds. This will take approximately 15 minutes or less; most properties done in about 5 minutes or less. You do not need to be home or present for the application. If you will not be home, please see instructions below about how to prepare your residence for the treatment. Please make sure that your property is accessible to the contractor’s crew. We need to treat front and backyards. All applicable outside gates and entryways should be unlocked. Animals must be kept inside for the safety of our crew. Rescheduling properties for treatment at a later date is time-consuming and costly, and can reduce the efficacy of the treatment. The scheduled time above is weather dependent. Very rainy weather or saturated soil increases the risk of the product being washed off the surface quickly and not entering the soil. Normal to light rain is OK. If it is too rainy on the day of scheduled treatment, or if we are delayed for other reasons, we will notify you of the rescheduled date as soon as possible. To get the Acelepryn G near the grass roots to be effective against root-feeding grubs, we ask you to water your lawn for 10-15 minutes at your earliest convenience. If it has rained during or following application, it is not necessary to water it in. Keep children and pets off the treated area as long as granules are still visible. 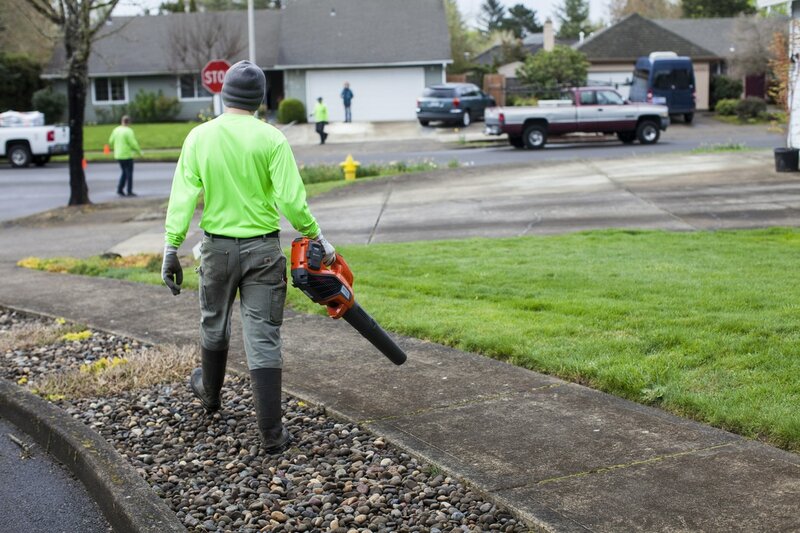 Inspect walkways and patios, and sweep-up or pick up stray granules (after putting on gloves). Granules are supposed to be watered in (unless applied during rain or it has rained since application). The area is then immediately safe to re-enter. 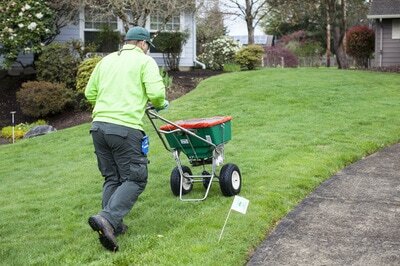 If there is a white marker flag in your yard, you may remove it after treatment. Am I in the Treatment Area? Visit this link to find out if your home or property was in the Japanese beetle treatment area for 2018. Use this same link to see where beetles were trapped during the summer of 2017. When you visit the treatment map by clicking on the button above, find the icon that looks like the icon on the right and click on it. 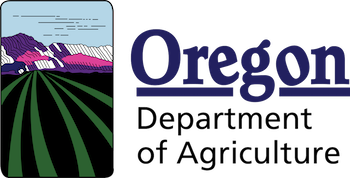 If you live within the treatment area, you will receive a notice from the ​Oregon Department of Agriculture with details about the project, including a consent form​. 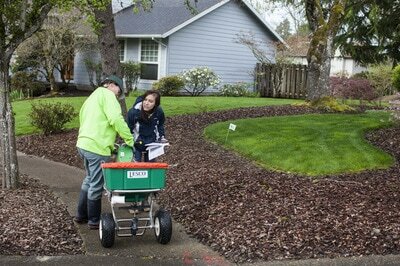 Treatment for Japanese beetle begins each year in April. ​Please return your completed consent form as soon as possible once you've received it. Have unanswered questions? Visit our Frequently Answered Questions page or contact us. The treatment crew applying Acelepryn G in the treatment area in 2018. Photographs by Samara Group, Jessica Riehl and Kailey Fry.